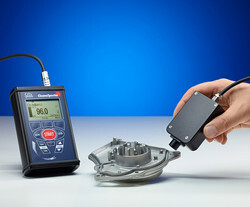 Inspection of parts’ cleanliness at the touch of one button within in few seconds. Measuring result: lowest and averaged cleanliness per part. Automatic calibration on a clean reference surface.. Robust sensor – reproducible measuring result – optimal for mobile and flexible use at the process and in the laboratory. The SITA CleanoSpector inspects the cleanliness of parts' surfaces. This ensures a high parts quality for processes of surface coating and surface treatment. 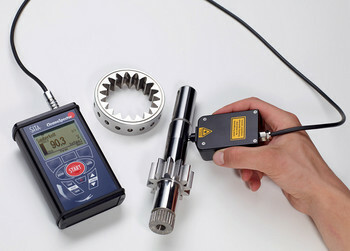 The fluorescence measuring principle allows a reliable detection of slightest traces of contamination such as oils, grease or cooling lubricants. Furthermore, the SITA CleanoSpector can also measure the layer thickness e.g. of oils, anticorrosive agents or bonding agents. The SITA CleanoSpector can be operated by hand or with the help of a stand which comes with the device. A robust construction and clearly designed operating structure ensures an optimal use at the plant and in the laboratory. After choosing an according surface profile, the operator starts the measurement at the touch of one button. The measurement takes about 1 – 10 seconds depending on the pre-determined average of measuring values. The cleanliness inspection is carried out especially on critical points on the part. The measuring device and the optional windows guide the operator through the parts control. The measuring result is displayed in percent and shows the lowest and averaged cleanliness of a part. 100 % cleanliness corresponds to an absolutely clean surface with regard to the used reference surface for calibration. The device operator can store limit values for a sufficient cleanliness in the device. This function and the set up of parameter can be done in the administration mode of the measuring device. The optional windows software SITA CleanoLog allows storing a reference curve for measuring the layer thickness of oils, waxes, corrosion protection agent and bonding agents. Thus, an easy and quick layer thickness measurement is possible. The device operator is allowed to pre-determine limit values for an acceptable coating thickness. The device sends out a signal if limit values are exceeded. The SITA CleanoSpector detects contamination due to their fluorescence which is excited by a light emitting diode (LED) with light in an ultraviolet range. 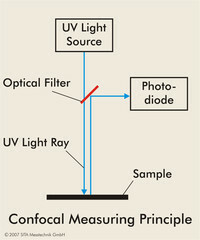 The fluorescence intensity depends on the amount of contamination at the measuring point. A photodiode in the sensor head of the SITA CleanoSpector measures the intensity of the fluorescence. The SITA CleanoSpector is based on the confocal measuring principle. This measuring principle guarantees a high sensitivity towards slight traces of contamination comparable with huge laboratory systems. The sensor head can be easily positioned. With non-contact measurement, ambient light is automatically detected and compensated. The main application field of the SITA CleanoSpector is controlling the cleanliness of parts. The objective is to ensure a high cleaning quality. Subsequent manufacturing processes such as coating, bonding, welding and mounting require sufficient parts cleanliness in order to obtain a high product quality. The picture show an evaluation model as it can be used for the cleanliness control. Contamination-free parts have a cleanliness of 100 % and correspond to the clean surface of the reference part used for calibration. The limit values for a sufficient cleanliness are determined by clean and poorly cleaned parts out off the manufacturing process. Heavy contaminated parts refer to a cleanliness value of 0 %. Another application is controlling the layer thickness of anticorrosive agents, oils, waxes or bonding agents. Our application engineers advise you, if you can use the SITA CleanoSpector for application and how to. We measure your samples and develop an appropriate controlling procedure together with you. Result: The SITA CleanoSpector optimally supports you for your application. The Windows-Software SITA-ProcessLog allows an easy control of all functions of the SITA CleanoSpector with the PC as well as a comfortable management of the saved measuring data. Use the SITA CleanoSpector for your application!